NEW YORK (Reuters) - World stocks sold off for a second straight session on Monday on persistent concerns over global economic growth, while benchmark 10-year U.S. Treasury yields fell to more than one-year lows. MSCI's gauge of stocks across the globe shed 0.47 percent, after it posted on Friday its biggest one-day drop in about three months. Wall Street's main indexes were little changed during a choppy session. 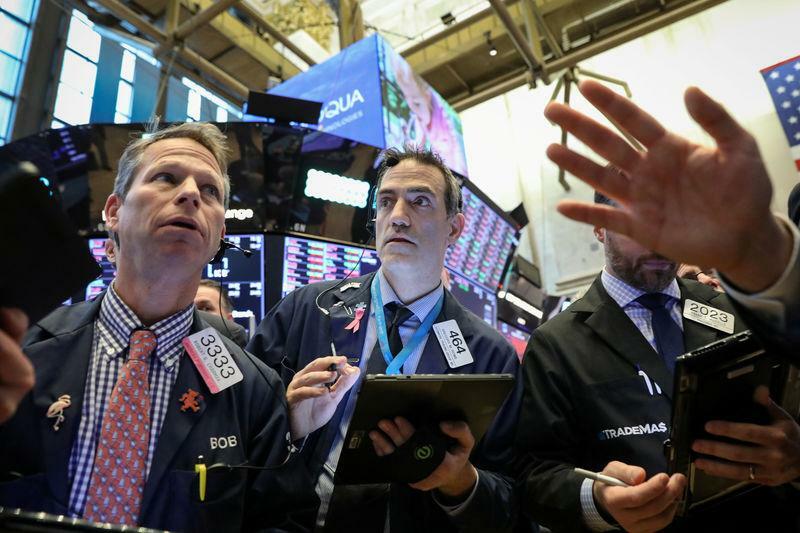 On Wall Street, the Dow Jones Industrial Average rose 7.75 points, or 0.03 percent, to 25,510.07, the S&P 500 lost 1.64 points, or 0.06 percent, to 2,799.07 and the Nasdaq Composite dropped 12.96 points, or 0.17 percent, to 7,629.71. The pan-European STOXX 600 index lost 0.45 percent. In one economic bright spot, a survey showed German business morale improved unexpectedly in March after six consecutive drops, with the results supporting European shares and German bond yields. Benchmark U.S. 10-year notes last rose 14/32 in price to yield 2.4071 percent, from 2.455 percent late on Friday. The yield fell to its lowest since December 2017. On Friday, the spread between yields on three-month Treasury bills and 10-year notes fell below zero for the first time since 2007. Such an inversion is a warning sign about the economy. On Monday, that yield curve was still slightly inverted. “We’re examining yield curve relationships in an environment where the Fed still has enormous control over the long end of the curve, given how much they own on their balance sheet, and we’re dealing with a very accommodative global policy regime as well,” said Tom Simons, a money market economist at Jefferies in New York. The dollar index, which measures the greenback against a basket of currencies, fell 0.12 percent, with the euro up 0.03 percent to $1.1315. U.S. crude fell 0.03 percent to $59.02 per barrel and Brent was last at $67.28, up 0.37 percent on the day. Gold prices rose to a more than a three-week high, helped by a weaker dollar and as worries over global economic growth pushed investors into safe-haven assets. Spot gold added 0.7 percent to $1,322.22 an ounce.